This weekend, on Saturday, March 16 Sabriya’s Castle of Fun Foundation (SCF) will host a blood drive in partnership with Children’s Hospital LA. It will be held at the Los Angeles Sentinel office from 10am-2pm. Not only does Sabriya’s Castle of Fun encourage blood donation, it also encourages overall participation with its foundation, a non-profit organization that has been offering “Fun Therapy” and supportive services to children with leukemia, sickle cell disease and other chronic blood diseases since 1992. Sabriya’s Castle of Fun was named after the daughter of Danny J. Bakewell Sr, Sabriya Bakewell, who tragically passed away after being diagnosed with leukemia. In a way to live out her legacy, Sabriya’s Castle of Fun Foundation was created and many people have volunteered to bring happiness and joy to children with cancer. One of those volunteers was Rayva Harrell. She says that working with the foundation was a pleasure because she loved working with children. After getting on the Board of Advisors, she would later find out that an unfortunate event would make her purpose within the foundation clear. “I had been on the board for one board meeting when I thought ‘what is my place in Sabriya’s Castle of Fun Foundation?’ Two weeks after that initial meeting, got a life-changing phone call about Amber Thursday night,” she said. Amber N. Griffin Sawyers was Rayva’s 13 year-old niece and also an SCF volunteer, who she primarily took care of along with her parents. After a 3-month period of Amber being sick with flu-like symptoms, the family finally sought further medical opinions. On March 28, 1995, she was diagnosed with Rhab­domyosarcoma, a children’s cancer made of cells that normally develop into skeletal muscles according to the American Cancer Society. Doctors gave her an estimated 60 days to live; they never imagined she would live much longer. Amber would then live for four more years, defeating the odds. Rayva explained specific details of her experience with Amber. “For four years I saw her happy, saw her sick, no hair, never wore a wig ever. She was a sick girl, but she was proud,” Rayva said. “She was so pretty, she looked like me,” added Amber’s father, Brian Sawyers with an enduring smile on his face. Rayva says that witnessing her niece go in and out of the hospital over those few years was heartbreaking because there was nothing she could do. “Amber needed blood all the time. And I think that’s when I found out that I couldn’t give blood because my blood was too low,” Rayva said. This is why Sabriya’s Castle of Fun makes it a priority to get people to donate blood because of the need and more specifically the need for Black blood donors. Certain blood types carry specific antigens that are only found in people of African descent or non-African descent. Because of low Black blood donors, the need is specifically high for Black children struggling with certain blood-related disorders. If you are a first-time donor, do not be afraid. After the initial pinch of the needle, nothing compares to the feeling of helping those in need and Children’s Hospital LA takes good care to make your experience comfortable. Amber was one of those who needed blood frequently. She volunteered with Sabriya’s Castle of Fun not only building toy castles for sick children, but also raising thousands of dollars for the foundation before even being diagnosed with cancer. Who would’ve thought that a Sabriya’s Castle of Fun volunteer who served other sick children would develop a rare form of cancer? 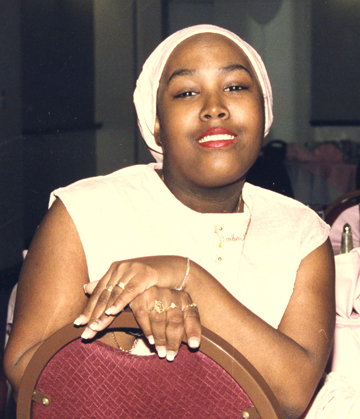 After passing away on January 22, 1999, six months before graduating from Crenshaw High School, her family completely transformed their lives to living in love and helping out the community. You can do the same! If you are 17 or older, then you can donate! Along with opportunities to donate blood, there will also be celebrity artists like R&B singer Leland and food provided by B.D. Burgers owned by Brian Sawyers, Amber’s father. It is a community event that Sabriya’s Castle of Fun Foundation hopes to make a huge difference in the lives of those in need.